Cabernet Sauvignon is now the undisputed red king of Washington state. Last fall, Washington grape growers harvested 35,900 tons of the noble Bordeaux grape, effectively doubling its output in the past decade. In fact, Cab is not far from being the state’s No. 1 wine grape – trailing Chardonnay and Riesling by about 2,000 tons in 2012. And with the way the wine performs in such regions as the Horse Heaven Hills, Red Mountain, the Wahluke Slope and Walla Walla Valley, it’s no wonder it’s quickly becoming a favorite with winemakers. 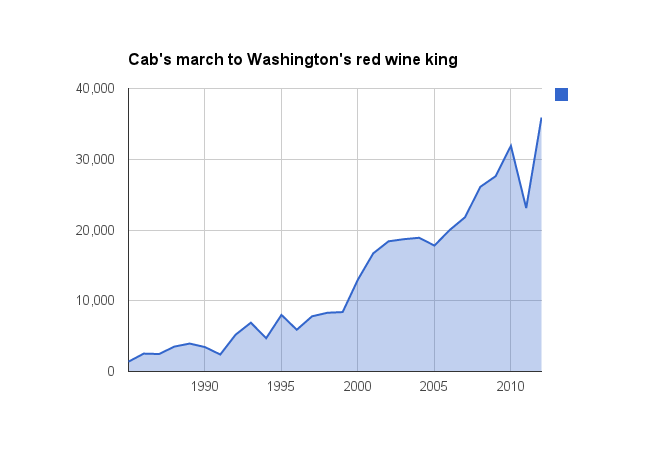 Back in 1985, when the U.S. Department of Agriculture began tracking wine grape tonnage in Washington, Cab was king with 1,390 tons crushed. By 1993, Merlot had taken the crown for top red wine in the state. That lasted until 2006. 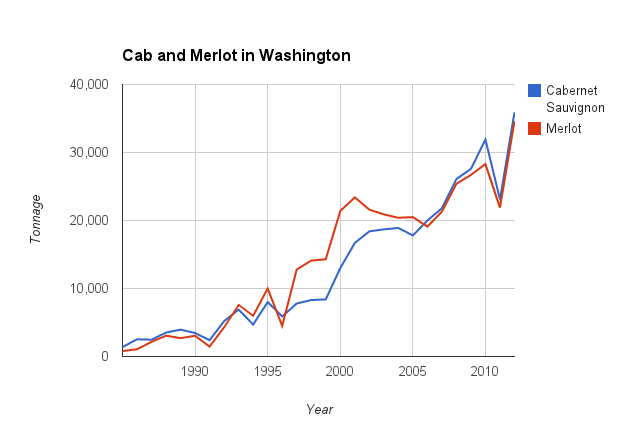 Both took dramatic dips in tonnage in 1991, 1996 and 2011, three years when bad winter events caused extensive damage across Washington vineyards. 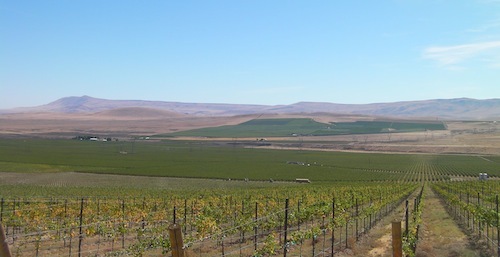 In the past decade, the Horse Heaven Hills has been recognized as a sweet spot for Washington Cabernet Sauvignon, thanks in large part to Champoux Vineyards. The vineyard run by Paul Champoux was planted in the early 1970s by the Mercer family. In the past decade, Quilceda Creek Vintners in Snohomish has earned a string of perfect 100-point scores from Robert Parker’s influential Wine Advocate newsletter. The vast majority of the grapes for those Cabs have come from Champoux. A few years ago, the Golitzen family purchased a vineyard adjacent to Champoux and renamed it Palengat Vineyard. 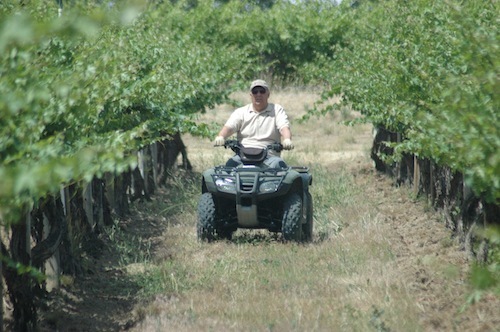 It is managed by Paul Champoux, and the Golitzens began making a vineyard-designated Cabernet Sauvignon from it in 2006. The Golitzens also bring in grapes from Red Mountain in the eastern Yakima Valley, where they own a vineyard and contract fruit. Jim Holmes, owner of Ciel du Cheval, has sold the Golitzens grapes for many years. In 2001 – the same year the Red Mountain AVA was approved – the Golitzens and Holmes teamed up to plant Galitzine Vineyard on Red Mountain. That has resulted in a vineyard-designated wine since 2004. The Golitzens also purchase grapes from Tapteil and Klipsun vineyards on Red Mountain. 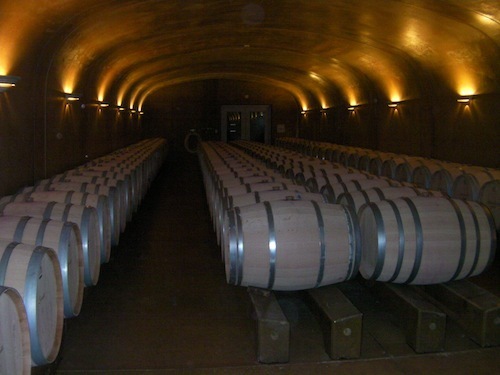 Inside Leonetti Cellar’s barrel storage caves in Walla Walla. To the east is the relatively cooler Walla Walla Valley, a region famed for such producers as Leonetti, Woodward Canyon and L’Ecole No. 41, all top Cabernet Sauvignon producers. While much of the fruit being used in the Walla Walla Valley is coming from the greater Columbia Valley – particularly famed Sagemoor Vineyards north of Pasco – a lot more now is being grown there. In fact, the owners of Leonetti, L’Ecole and Pepper Bridge co-own Seven Hills, a top vineyard that is on the Oregon side of the Walla Walla Valley. 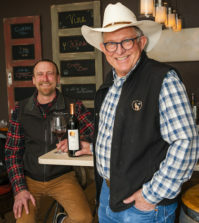 And Rick Small, owner of Woodward Canyon, uses Cabernet Sauvignon from his estate Woodward Canyon Vineyard on the northern edge of the appellation for some of his top wines. The Figgins family, owner of Leonetti, dry farms its Mill Creek Upland Vineyard east of the airport near Walla Walla Vintners. Its estate Loess Vineyard is at the winery just south of downtown Walla Walla. And, of course, it uses grapes from its estate Seven Hills Vineyard. 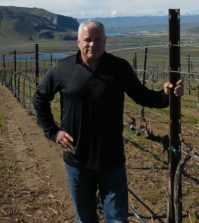 Chris Figgins, second-generation winemaker and president of Leonetti, also produces a single-vineyard wine under the Figgins label from Figgins Estate Vineyard not too far from Mill Creek Upland. In fact, the Walla Walla Valley has emerged in the past few years as a haven for red winemaking, in particular Cabernet Sauvignon and Syrah. 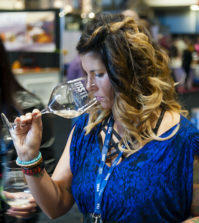 A recent tasting conducted by Great Northwest Wine on behalf of Wine Press Northwest magazine further showed this trend. Of the 27 wines that earned our top “Outstanding” rating, 11 were from the Walla Walla Valley – and seven of those carried the Walla Walla Valley AVA designation on the label. Appropriately, the Walla Walla Valley Wine Alliance will hold an event in June called Celebrate Walla Walla Valley. It will focus on Cabernet Sauvignon and will bring in top winemakers from Napa Valley to look at the differences and similarities between the two classic Cabernet Sauvignon regions. Two other areas of Washington that are producing superb Cabernet Sauvignon grapes are the Cold Creek area and the Wahluke Slope. Cold Creek Vineyard is just north of the Yakima Valley town of Sunnyside and is owned by Ste. Michelle Wine Estates and is one of Chateau Ste. Michelle winemaker Bob Bertheau’s favorite sites. But there are other vineyards nearby, including Wautoma Springs. This was one of the primary sources of Columbia Crest’s 2005 Reserve Cabernet Sauvignon, which was ranked No. 1 in the world by Wine Spectator magazine in 2009. Farther north and west is the Wahluke Slope, which rivals Red Mountain as one of the warmest areas of Washington. The Wahluke Slope doesn’t necessarily get as much respect from consumers because it is so remote and lacks amenities such as tasting rooms and restaurants. But it is considered a backbone of the industry because it produces some of its most consistently superb red wine grapes. In fact, the top wine of that Cabernet Sauvignon judging was from Milbrandt Vineyards in Prosser, which used grapes from estate vineyards on the Wahluke Slope. Milbrandt, whose wines are made by former Ste. Michelle red winemaker Joshua Maloney, is proving itself a serious player. 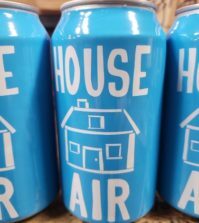 It now makes about 80,000 cases of wine under its own label (and a whole lot more for other wineries), and it had the Nos. 1 and 4 wines in our Cab judging – with the No. 4 wine being a $15 Cab! These are just a few reasons why Cabernet Sauvignon – the legendary wine of kings and the king of wines – is so important to Washington winemakers. Great article, Andy. In your first paragraph you said: “In fact, Cab is not far from being the state’s No. 1 wine grape.” My question to you is, what is currently the state’s No. 1 wine grape? Great point. I updated that sentence to indicate that Cab is about 2,000 tons behind Chardonnay and Riesling. Gård Vintners recently scored a 92 (WS) with their Royal Slope estate Cab ($35), may be worth mentioning.